If it sometimes feels like you’re counting pills more than the dollars left in your wallet, take heart, because there is financial hope. And, fortunately, it doesn’t require you to trade your health for financial benefit. Keep reading to discover money-saving strategies that enable you to have your financial cake and take your pills, too. The squeaky wheel gets the grease. Regardless of whether or not it’s fair, it’s true; those who don’t a-s-k, simply don’t g-e-t, even when it comes to the prescription drugs they need. The key to making sure your “rx” requests don’t go unrewarded is knowing who to ask, what to ask and what to ask for. The following is a primer for consumers who are looking to get prescriptions at a fraction of the price. Start with the person writing the prescription you need: your doctor. The next time you’re sitting alone waiting in the exam room, take a look around. Notice the notepads on the table, the pens waiting to be used, and quite possibly the clock on the wall? Chances are they all tout the name of some drug or pharmaceutical company. Pharmaceutical representatives leave all these little freebies with your physician as well as a multitude of free medication samples. So the next time your doctor reaches for his or her prescription pad, speak up and directly ask if it would be possible to get some free samples of the medication. The worse they can say is “No,” and even if that’s the answer, chances are pretty good that it will be followed up with information on how you can save money on your medication. Often there are patient rebate programs and additional savings opportunities such as mailing lists and extra coupons that doctors may be aware of that consumers are not. Cash in on the savings that generic medications offer. Just as effective as their name brand counterparts, generics can be purchased for a mere fraction of the price. Be sure to ask your doctor if a generic is available for the medication you need. Forgot to ask at the doctor’s office? Inquire at the pharmacy counter when you fill it. You can also ask your doctor to optimize your doses. With the advent of time-release medications, it’s often possible to step down to fewer pills each day and still experience the same health benefits. A dramatic decrease in the number of pills you take can be a relief for both you and your budget. Another “optimizing” option includes obtaining a prescription for high-dose pills and then splitting them yourself to achieve single-dose portions. For the price of one medication refill and the assistance of a pill splitting tool (readily available at most pharmacies for under $8), you’ll immediately reap two month’s worth of medication for the price of one. While the opportunity for financial savings is clear, no price tag can be put on good health. Don’t risk it. Check with your doctor and ask him or her if optimizing your prescribed dosage is a viable option for you. 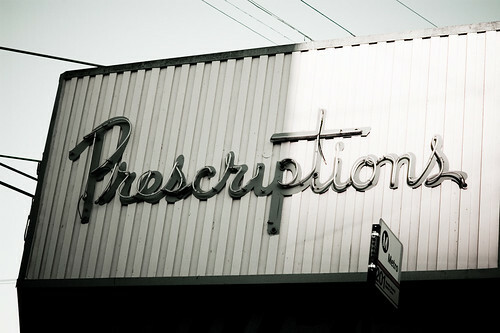 After you’ve asked your doctor, next it’s time to turn to the source of the medication itself, the drug manufacturers. At the very least, a quick click at a drug company’s website will often uncover a printable coupon and sometimes even a long-term savings program of sorts for patients who take their medications on a maintenance, or ongoing, basis. To find the pharmaceutical website for your particular medication, get online and use a search engine to look for your medication by name or call your local pharmacist. (For specific information on how to get online and conduct a search, see the appendix near the end of the book.) Even if these are not available, it can be worth it to give the manufacturer a call anyway. Oftentimes, if they themselves do not offer any kind of patient assistance program, they will know of other programs and agencies that may be able to help. It can be difficult and, quite frankly, nearly impossible to keep up with all the changing programs, offers and discounts. Your pharmacist is your number one resource and best bet for learning about such money-saving, prescription-providing offers. Just as you can save by purchasing food in bulk, the same potential savings applies to medications. And, thankfully, there are a number of ways to do so. From warehouse clubs to your neighborhood discount retailer to mail order prescription services, there are a number of ways to get your medications and keep more of your cash, too. Whether you’re looking to purchase OTC medications or just fill a prescription, a warehouse club such as Costco or Sam’s Club can be a phenomenal way to save money and gain convenience at the same time. Most warehouse clubs carry their own discounted brand of OTC medications at a substantial markdown compared to their name brand counterparts. You’ll likely need to purchase a large quantity, but you’ll also limit the number of trips out to actually purchase the medication. As a service to members, warehouse clubs also often offer discounted costs on prescription medications. Unless you’re also taking advantage of some of the other savings warehouse shopping can offer, you’ll want to compare the cost of membership to your actual medication savings. If your overall savings isn’t more than the cost of the warehouse membership itself, it isn’t financially worth it to join in the first place. Want prescription savings with the convenience of just heading down the street? You’re in luck because you can have both! Limit trips to the pharmacy counter and save money while doing it by opting to fill more than one month’s worth of refills at a time. Most retailers now offer discounted prescription programs that allow customers to refill a three month’s supply of medications for a discounted price. To take advantage of this, first check that your maintenance medication is on the pharmacy’s list of discounted medications. Next, check with your insurance company to make sure they permit multiple refills. If so, ask your doctor to write your prescription to reflect a minimum of a three-month supply.